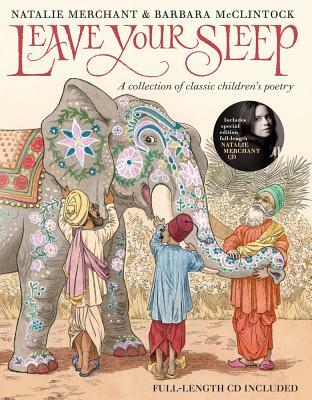 This collection of classic children's poetry, adapted to music by Natalie Merchant, opens the door to a wondrous world filled with witches and fearless girls, blind men and elephants, giants and sailors and dancing bears. Leave Your Sleep features a daring and delightful selection, ranging from the beloved (e.e. cummings, Edward Lear, and Jack Prelutsky) to the undiscovered (the young Nathalia Crane). Natalie Merchant's brilliant musical renderings, selected from her highly praised album, share the stage with Barbara McClintock's richly imagined art to create a memorable reading, looking, and listening experience. Natalie Merchant is a musician who for the past 30 years has been recognized as one of America's most gifted singer-songwriters. She lives in the Hudson Valley of New York. Barbara McClintock attended Jamestown College in North Dakota until, at nineteen, she moved to New York City to begin her career as an illustrator and author. She has written and/or illustrated many acclaimed books for young readers, among them Adèle & Simon, an ALA Notable Book and a New York Times Book Review Best Illustrated Book of the Year, and Lost and Found: Adèle and Simon in China. She lives in Windham, Connecticut.